Visit Madison365.com for full article and images. “Changing the narrative of students – that’s so important,” says Dr. Shawn Robinson. The adjunct professor at Rockford University makes it his personal mission to help his students advance their own potential, a struggle that he understands very well. Robinson has intimate knowledge of what it feels to be pushed through a school system that is more focused on demonstrating target numbers in graduation rates rather than ensuring the fundamentals of a good education. He was in his senior year of high school when an instructor took the time to look for the truth behind the difficulties he had always experienced in school. The answer was dyslexia. In an interview with Madison365, Robinson describes what it was like to be a young black male who did not yet understand that he had the same abilities as other students, but processed information differently. “It’s like you want to learn but at the same time you don’t know how to communicate effectively. The way to communicate is through outbursts or inappropriate behaviors.” Once dyslexia was identified, an individualized education plan was implemented that supported his learning, allowing him to finally learn to read. With his mother championing his ability for achievement at the college level, Robinson progressed forward until he received a doctoral degree in literacy and language. With 13 articles accepted for publication, Robinson presented his findings to a team of White House advisors, shining a light on the subject he feels most passionate; dyslexia and racial disparities in academic outcomes. It was a long road, and his experiences led to his understanding that performance improves when a student is able to recognize his or her unique gifts. 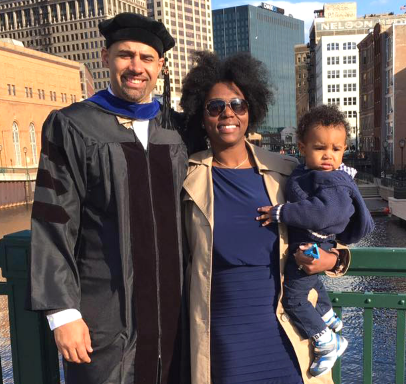 Dr. Shawn Robinson with wife Inshirah Robinson and son Jeremiah. The post Uncovering Backward Thinking toward Gifted Learners appeared first on Project E3.